Villagers in Bengkala signing the symbol for "love." Those who visit Bali tend to rely on English, which many locals can speak. Fewer visitors have mastered Indonesian, the official language. Balinese is hardly spoken among those who aren't natives. But up in the jungle of northern Bali, there's an even more elusive, geographically-consolidated language, foreign to even the native Balinese: kata kolok, a language that's never even been spoken. Kata kolok, known as "the talk of the deaf," is a unique, rural sign language, independent of international or Indonesian sign language. It's been the primary mode of communication in the northern Bali jungle village of Bengkala for generations, where a high percentage of residents are deaf. In Balinese, Bengkala is sometimes called "Desa Kolok"- the deaf village. Bengkala has had a higher than normal deaf-since-birth population for over seven generations. Today, 42 of Bengkala's almost-3,000 villagers have been deaf since birth. By comparison, about two or three births per 1,000 in the United States produce a deaf or hard of hearing child. The high percentage of deafness is caused by a geographically-centric recessive gene, called DFNB3, which has been present in the village for over seven generations. For years, villagers believed the deafness was the result of a curse. "The famous story is that two people with magic powers fought each other and then cursed each other to be deaf," said Ida Mardana, the mayor of Bengkala village, who speaks Balinese, Indonesian, and English, in addition to signing kata kolok. "The meaning of Bengkala is 'a place for someone to hide.'" 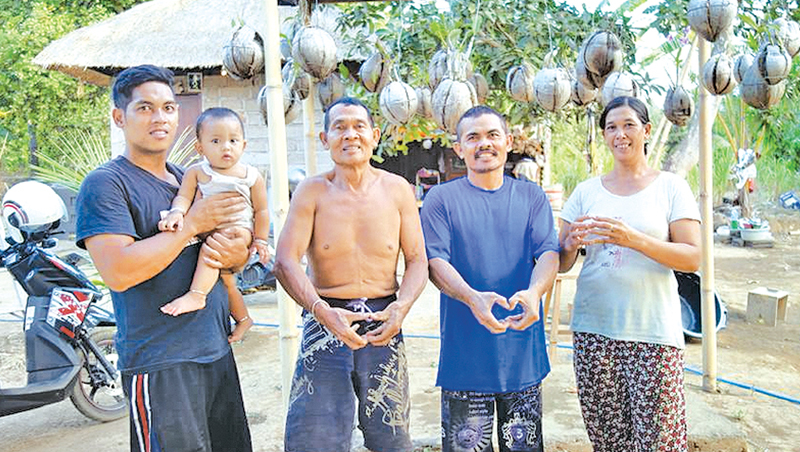 Rather than ostracizing deaf residents, villagers in Bengkala have adapted to a deaf lifestyle. Throughout the village, people speak with their hands. Hearing villagers teach their children kata kolok in the home as a second or third language, planting seeds of equality that grow through adulthood - an adulthood that could consist of raising a deaf child of one's own, since almost 10 percent of hearing people in the village carry the recessive deafness gene. "Deaf students learn together with hearing students here," Mardana told me. "The teacher uses speaking and sign language at the same time." As a result, nearly everyone knows kata kolok; the deaf and mute population can communicate with ease. As one writer put it, in a book called Invisible People, "Being deaf [in Bengkala] is not something that is carried by the kolok alone. It's something that belongs to the entire community." The differences between the deaf and the hearing are smaller here than almost anywhere in the world. "I feel equal like everyone else," signs 72-year-old village elder, Wayan Sandi, pressing his index fingers together to stress the word equal. "We are one in the community here." But if communication has become a non-issue for those within the village, it still poses problems outside, where deaf villagers have trouble selling goods at local markets and can't communicate with those who don't know their unique form of sign language. The majority of Bengkala's villagers, like Sandi, are poor farmers who grow bananas, mangoes, guava, and elephant grass, and care for a handful of cows and pigs and a few hundred chickens. At the local market, they have to use weighted stones and hand gestures to sell the fruits of their labor. "Sometimes [the deaf villagers] face a little difficulty communicating," said Kadek Sami, a hearing woman who has two hearing children with a deaf husband. "But they overcome with simple signing." The younger generation of deaf in Bengkala have started to embrace new forms of communication - smart phones, social media, and international sign language. In recent years, more deaf teenagers have enrolled in a nearby deaf boarding school in Jimbaran, where they can learn Indonesian Sign Language and integrate with a broader community of deaf people in the country. Still, only five deaf villagers in Bengkala are literate. For Mardana, who has been the mayor since 2010, that's not good enough. The village is poor and the level of education is low - both problems that are even worse among the deaf villagers who can't communicate with the outside world. 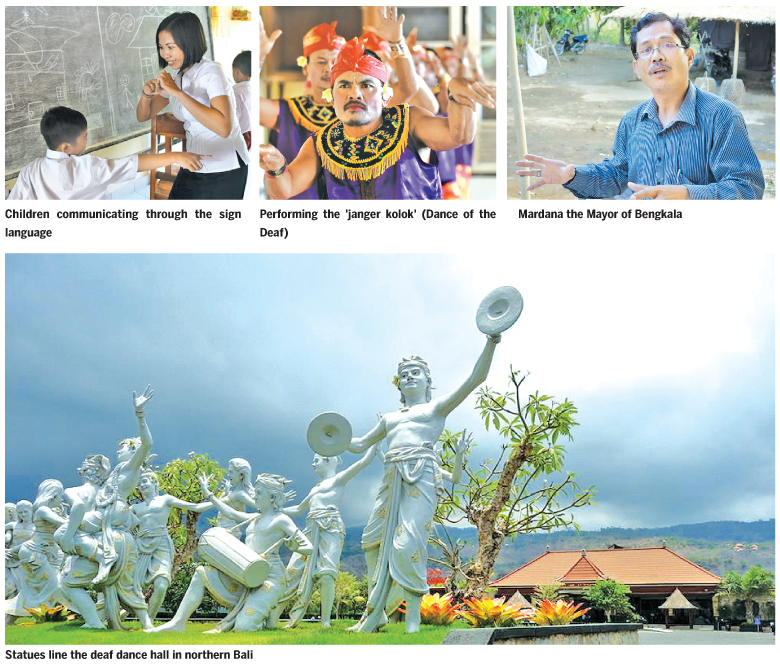 "The kolok [deaf villagers] want to be better people," Mardana said. "I want them to start getting involved with the community, so they can help themselves and get a better income." Through Mardana's efforts, the Indonesian government and Indonesian energy giant Pertamina have recently supplied the village with farming infrastructure, new buildings, and programs to provide training in new skills, like weaving, to the kolok. On an international level, scientists, sociologists, and deaf tourists have all trickled into the village to study or simply witness the little-known, genetically-forged society. Few, however, stay long enough to make a lasting impact. Instead, the most empowering initiative to date has been the introduction and development of janger kolok, or "the dance of the deaf." The specific style of dance, created with Bengkala's deaf population in mind, and has been the pride of Bengkala and the village's most creative outlet for three decades. The Deaf Dancers of Bengkala take the stage roughly three times a month. The group is made up of 16 deaf villagers, ages 16 to 72, who perform synchronized dance routines. While some performances take place in the village and at a local university, their highest profile performances are held at Bali Krishna, a modern exhibition hall in northern Bali. Sandi, the group leader, hopes they will one day become "the number one dance group in all of Indonesia." The magic, of course, is in the synchronization. Without music, it's difficult to keep rhythm, and yet the Deaf Dancers of Bengkala step perfectly in time with each other, using visual cues to keep the beat. "I saw the performance once, and they were so enthusiastic that I wanted to help them with their movements," said local singer and volunteer Putu Gedeasnawa. "We are working on synchronizing at the moment. The power of the dance is in the eyes." All profits from janger kolok in Bengkala go to the dancers, which Mardana hopes will help create a more consistent performance schedule and boost tourism to Bengkala. The village wants to increase the income of the deaf population, but they also want to increase tourism to the village, to expose others to the "oneness" between deaf and hearing people in Bengkala. "Outside the village, I assume they think normal is better," signs the 72-year-old Sandi. "I feel the same as everyone else here in Bengkala."